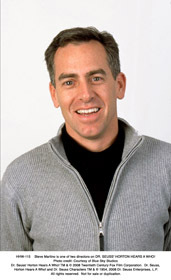 Kiddies, how much do we luv the animation? 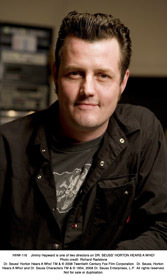 I think there’s been plenty of evidence sprinkled throughout the site to attest to that (- like here, for example). But also read here, we know a good egg from a bad one (- click again). As a fan of the medium, it’s always a joy to have a really good omelet. 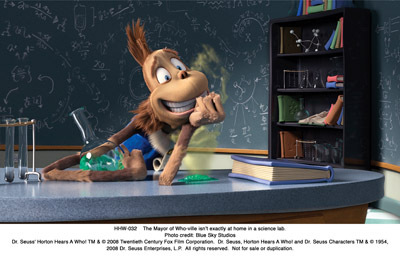 The good folks at Blue Sky studios have created their own niche in the computer animation stakes. 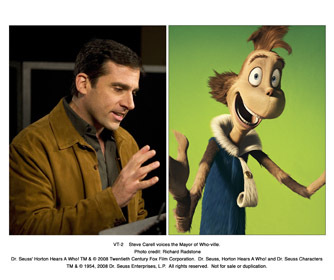 Their 2002 box office winner Ice Age, which cleverly brought angsty woolly mammoths and macho sabre-toothed tigers to life, put the company on the same stage as their glorious predecessors, Pixar. 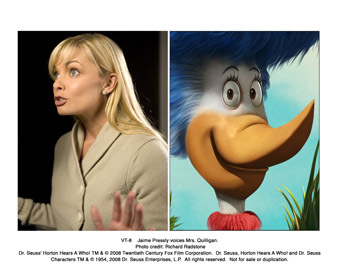 Now, lucky people, they bring us another interpretation of a world that looms large in the imaginations of children: In recent years the flammable-looking Styrofoam sets and creepy Whos of the live action How the Grinch Stole Christmas, and the retina-damaging horror of Mike Myers in a fuzzy catsuit in The Cat in the Hat, lowered the bar significantly on adaptations of the works of Dr. Seuss. 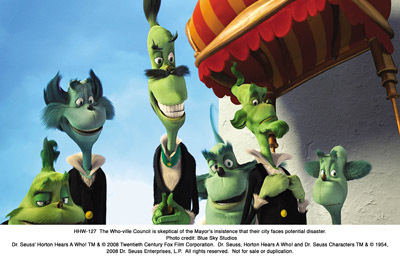 Happily, with Horton Hears a Who, Blue Sky has graced us the worthiest interpretation of the world created by Theodor Seuss Geisel since the How the Grinch Stole Christmas TV special of 1966. Horton’s story has been a feature at bedtime since 1954. 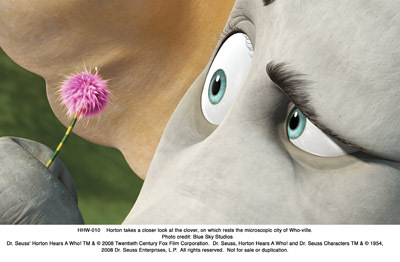 Horton is convinced that a windswept clover is carrying an entire planet of people living on a tiny speck. 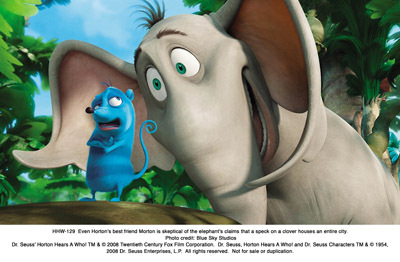 Horton can hear their voices, but no one else can. The kind-hearted pachyderm (- is there any other type? 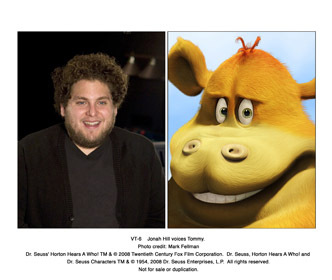 ), previously happy with his idyllic life in the cool pools in the jungle of Nool, becomes the protector of the Who-ville citizenry, taking on the slings and arrows of his neighbours, who viciously turn on him because they can’t see or hear what Horton believes. 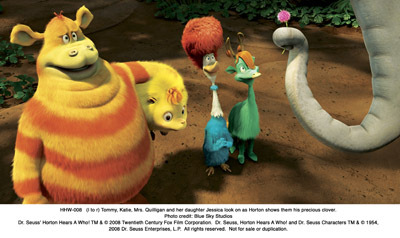 Horton suffers being chased and harassed by these neighbours who will do anything, including imprisoning Horton and boiling his precious clover in oil, to prove that he’s wrong. 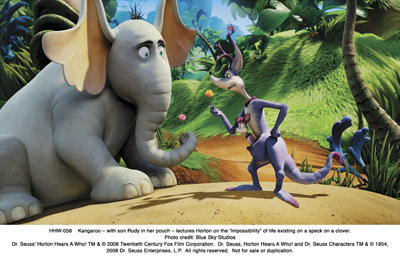 Theodor Geisel’s characters and the colourful tropical flora of Nool were perfectly rendered in CG animation. 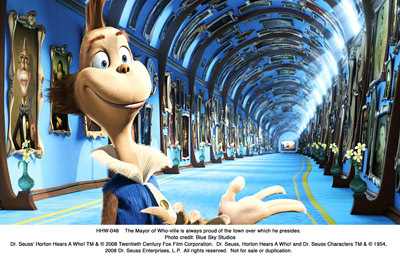 Yet, despite a lot of additional scenes and characters, the creators don’t go too far off the deep end to try and modernize the Seuss book; the wafting jewel-coloured palm fronds that surround the jungle and the swirling Dali-esque Who-ville architecture are just as in the book. The depth of field this particular style gives the artwork adds a whole new element and really brings the story to life. The only thing that could’ve made for a better experience was if there was a 3D version of the film, but the scenarios are so crystalline and sharp that it’s not far off. The Blue Sky folk do something different and amazing in the film in an homage to the old and the new, they intersperse a quick flash of flat hand-drawn animation reminiscent of the Chuck Jones directed TV specials showing the Whos in peril, and later there is a wonderful Japanese Anime sequence we see the hero inside Horton (- showing off a Dragonball Kamehameha move). 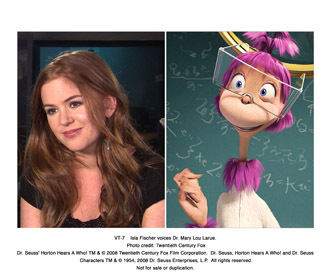 Those small segments are like little jolts of energy to an already captivating film and show that the forces behind Horton Hears a Who held a true desire to make a worthy creation of art that would do justice to the magic of Dr. Seuss. 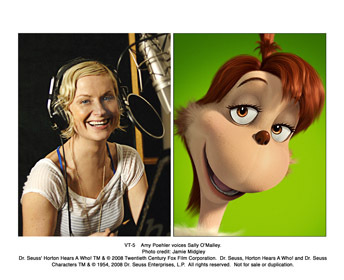 Directors Jimmy Hayward & Steve Martino do a remarkable thing in lining up a star-studded cast to lend their voices to the Horton characters and then restraining some of their signature tones, rendering them almost unrecognisable. 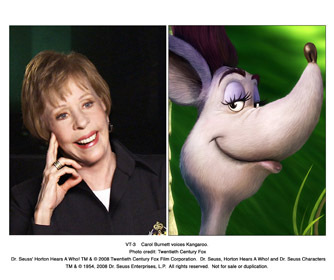 Jim Carrey is Horton, Steve Carrell is the Mayor of Who-ville, and the only who knows about “the elephant in the sky.” Carol Burnett makes a welcome turn as the narrow-minded, busybody Kangaroo, whose insistence that she’s right and Horton is crazy moves her to turn the peaceful jungle folk into a raging mob out to get Horton and his clover. 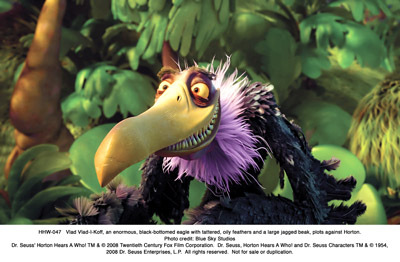 The brilliant Will Arnett plays a hired hitvulture for the Kangaroo who takes his cues from Bela Lugosi and Tony Soprano. 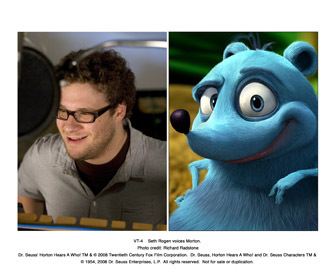 Seth Rogan, Amy Poehler and Isla Fisher all take supporting roles, as well. 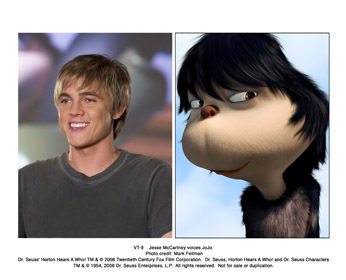 The precious few words spoken by the Mayor’s beloved son, the adorable, emo-y Jo-Jo, are voiced by the not-at-all-emo-y teen star, Jesse McCartney. The brave choice not to make the stars sound obviously like themselves allows the characters to really become their own, fleshed in by the voices of the cast. 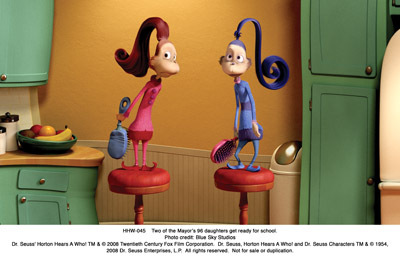 Normally, Carrey and Burnett only have to open their mouths to be instantly recognised, but in suppressing some of their famous characteristics the story takes centre stage and no one is distracted by the star power behind the characters. 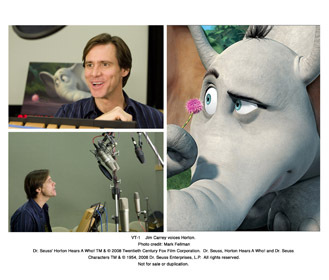 What Horton does inherit from Jim Carrey is his rubber face (- that extends to his expressive ears – much daintier than my own) and his flexible physicality. 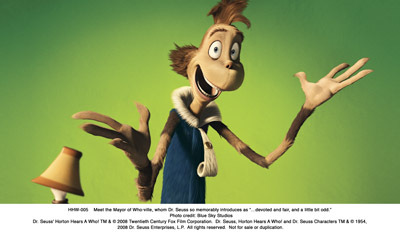 The humor in Horton Hears a Who is precious sparing on the lowest common denominator bodily function jokes that Hollywood seems to think is the only way to make a kid laugh. 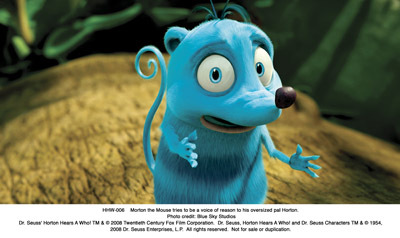 The script is accessible and lots of fun for the little ones while being witty enough for the grown-ups; besides Vlad’s Bela Lugosi imitation, there are riffs on Apocalypse Now, and Jo-Jo is made to look like a Who version of Paul Dano’s character in Little Miss Sunshine and is nearly as silent. 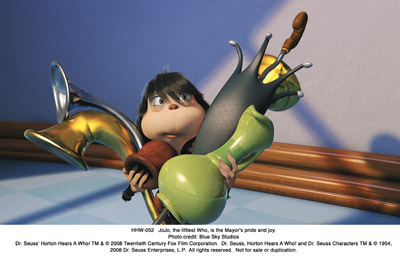 The wonderful scene where Jo-Jo indulges in a series of acrobatics to get to his secret conservatory lab is flowing and beautiful, the looping design lab itself showing us that Tim Burton must’ve gotten more than a few design cues from Dr. Seuss. Another scene where The Kangaroo is rallying the jungle natives against Horton plays like Tilda Swinton’s witch going to war in the last Chronicles of Narnia film. 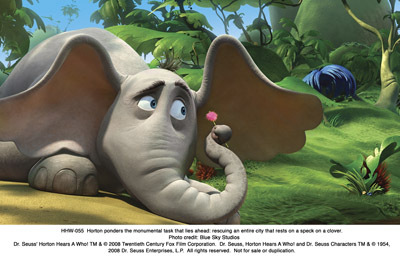 The pacing is great, especially the chase scenes where Horton is running for the lives of his microscopic friends. 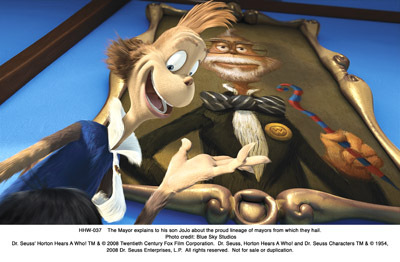 As is so exemplary in the Seuss book, are the lessons tucked into Horton Hears a Who, messages about kindness, individuality, concern for others, doing the right thing even when everyone says you’re wrong and being a loyal friend. 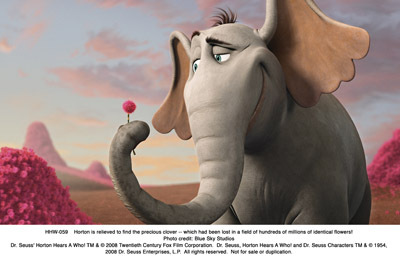 With so much controversy about how much kids imitate what they see in movies and TV, Horton is a character I do hope children and their parents emulate. 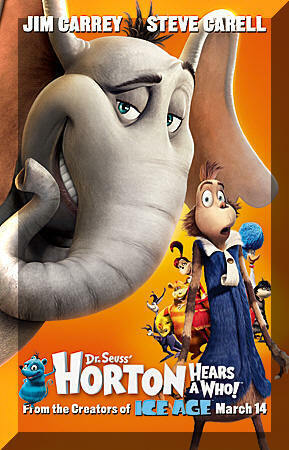 Horton Hears a Who is a delightful and winning film that really is fun for everyone, and a worthy interpretation of the beloved Dr. Seuss fable.